Lion Books of Taiwan: Kung Fu Included here are both new and reprinted books from Lion Publishers of Taiwan. The reprint series is excellent offering many out of print books in consistent, oversized format. NOTE: These books are written in Traditional Chinese only. NOTE: Please be aware that we only have one or two copies of some of these. Many aren't even in print any more. Even if it is listed here it may already be out of stock (we try to keep it updated but they go fast). A very strange Fu Yuan Style Tai Chi Chuan along with some pages on Push Hands, Da Lu and applications. He shows warm ups , partner striking and some training equipment such as weights, Mei Hua poles, free exercise and more. Forms include the Liu He Six Harmony Saber, Eight Immortals Straight Sword, Crescent Moon Spear, Shaolin Spear, Shaolin Staff, and the Adze. All this is followed by a section on Yue family fighting techniques. Then a chapter on archery and drawings of strange weapons such as the chain claw-hook. More on two person stretches, push ups and the Horse Knife. Then other unusual and basic training methods such as walking around the rim of a pot, roped stumps and more. Next a short but difficult Ziran Fist set. This is succeeded by seated BaDuan Jin, more theory and then an instructors profile. An amazing amount of information, especially for its time 412 pages, many old photos. This book was originally published in 1933. The "Chopper" is very famous in 20th century Kung Fu history because, in the Sino-Japanese War, chopper weilding Chinese fighters acquited themselves superbly against Japanese soldiers, even wielding the famous Samurai sword. Weapons stores in Taiwan display soldiers around this time carrying rifles and choppers and executing Japanese captives. Two "roads" are given, each with twenty moves and clear explanations of the practice which is very straight forward and direct. One of the early books during the decades of China's attempts to redefine herself. Texts like this which not only released previously unpublished information also helped to kindle a spirit of camaraderie in the daunting task of re-building Chinese strength and prestige. The Tan Tui was not only a form, it became a movement and, with its clean and powerful lines, even a bit of a symbol itself of using the Chinese martial arts (the past) to win a place among nations in the future. Small line drawings, almost faded at times. A text that describes the form and also deals somewhat with the above topics. Another nice collector's piece and a reprint of a text almost a century old. This big book of over four hundred pages explores the style of Tong Bei (also known as Tong Bi) Boxing. It is filled with traditional Chinese text and only a medium sized photograph every few pages. It is also one of the first books ever written on the style . Middle Lever Third Training：Six Roads、Sparring、Gloves、FlatHand、Grasping、Light Body Training、Point Attacks, Iron Palm Training with drawings of the bench, wall bag training, Nine Dragon Palace training. Tong Bei is becoming a highly visible style and the inheritor of much advanced Chinese martial technique. Though the name goes back far into CMA past the style has been renovated and enlarged by additions from other styles such as Pigua. Now it is having a revival of interest many people suggesting it to be am “Internal” form of Boxing and an excellent representative of what’s best in CMA. A major, big book for its time. 160+ pages, great old photos. "Jiang Rong Qiao the editor, published this book on January first 1930 from the ShangHai World Publishing Company. The complete text is divided into the following sections: A call to action, preface #1 from Zhang Zhan Kui (張占魁), preface #2 from Yao Fu Chun (姚馥春), preface #3 from Zhang Jian Quan (張劍泉), an introduction by Jiang himself, Table of Contents, the main text of the book. Jiang was a great master of the whip art, the Tiger Tail Whip, Watermill Whip, the whip art against the spear, and the whip art applied in diverse usage. His inheritance of the whip art derived from Hebei Salt Mountain area teachers 劉九如 Liu JiuRu, Zhang Xian Dao 張仙島, Zi Yu San 字雨三. "The Big Battle of the Whip and Spear" shows the whip's technique against the spear by demonstrating their choreographed battle. The art of the whip is profound enough to have few followers, and furthermore making the Whip and Spear Battle with the single whip even harder to understand. Jiang considered the whip a major weapon because it contained, in its own way, so many attributes from so many other weapons such as blocking 攩, picking 擿, throwing 摔, falling 掉, dotting 點, circling 掍, intercepting 截, etc. ... from a 28 words master formula, and Liao 撩, Zan gather 攢, Sou Seeking 搜, Ci Stabbing 刺...etc. from an extended 40 word rhyming formula, each move different from all the other weapons though the same general energy. The mock battle, has Chinese Wushu's distinct characteristics, not only for the basics of actual combat, and skillful techniques mixing practicality and combat performance, but also showing the muscles and bones of Wushu's performance blending strength , beauty and demonstrating a high achievement. 142 Pages, old fashioned illustrations. The Fang Tian Fork. This is a charming piece on a rare Kung Fu weapons, the Fang Tian. In this case it might be described as a spear with a crescent moon hook below the spear tip. In some cases the shape can differ until it resembles a TV antenna. Added to the actions of the spear the Fang Tian also covers hooking and side slicing actions. The illustrations are rough and ready with no pretense at anatomical accuracy. They are also kind of wonderful. This is a facsimile of a hand written copy style of type. It discusses the theory of Shaolin boxing in traditional and even mystical terms such as the changes of the Five Elements, the origin of the Shaolin Dragon method, four seas method, the Empty Solid method, the Plum Blossom Five Tablets boxing, the subtle practice of Internal Strength, and others materials. A candidate for partial or complete translation? Our previous offering was an explanation of the art of the Spring Leg as handed down through the lineage of Ma Yong Sheng. And here we have Ma’s own original text written in 1934 on the set with these wonderful old photos of Ma himself. It would be nearly impossible to actually learn the set from this book which, unlike the previous, shows too few transitional photos to really capture all the actions. But it is great to see the performance of a real Tan Tui master such as Ma. For the last few years we’ve been listing this as out-of-print (TC 1004) but we have located some copies so we offer them here. Personal advice, get a copy and put it in your library. The San Cai, originally from Xing Yi as we understand it, is considered one of the best, if not the best, two person practice set for the straight sword in all of Kung Fu. This book shows the set divided into three portions, with names such as Hawk form, Bear form, Advancing Rib Thrust, White Snake Spits Book form, Embrace the Moon, Wild Goose Leaves Flock, Blue Dragon Wags Tail, Immortal Points the Way, Blue Dragon Enters Cave, Golden Pheasant Pecks Rice, Turn One's Head to Regard the Moon, and others. There is a good section in the front of the book on the origins of the sword and its construction. Old pictures, but not too bad considering their age. Probably written in the early thirties, this is a book with charming illustrations of the "Hidden Sect" Tai Ji sword. The instructional text is proceeded by a number of appreciations by many instructors accompanied by full page portraits, most being instructors in combinations of Tai Chi and Bagua or Xing Yi. A nice collector's piece combining old photographs and interesting drawings. There are those who feel that the Kun Wu sword is one of the only really important sword sets in Chinese martial arts. A favorite of many people including Li Jing Ling, Liu Yun Chiao and others, the Kun Wu derives it complexity from movements that appear simple. Old photos of intriguing quality. Inclusions are the set itself, some usage at the back, preperatory remarks on footwork and the Ten Characters for sword. A nice addition for that collection of CMA sword work. It is rare nowadays to see much major new work in traditional Chinese on the art of Wing Chun. Here is the second book (see A 302 below) in this series. It is filled with information not associated with the more standard forms of Wing Chun. Besides sections on the Wooden Dummy, and the Butterfly Knives and Wing Chun Staff; there are also writings on Red Sand Hand, Shadow Hand, Small Cyclone Partner Staff and the Comet Straight Sword. A plethora of unusual information on this art. oversized (apprx:7 3/4 X 11 3/4),illustrations. 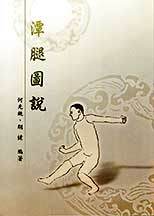 This is a rare Taiwanese book on the art of Wing Chun Pai. It covers all the basic concepts especially revolving around the standing fist and shows teacher and students performing Little Idea, Searching for the Bridge, Dart Fingers and the lesser known form Four Gates. The background information states that though many learn the art few known how to really apply it. According to the author, many parts previously unexplained are examined here. This book is based on the "Ten Fist" which, in English, would best translate as the Cross Fist. Though not a long book there is a lot of information. Basic strikes are covered by CLF style, not generically. Also there is a section of wooden dummies and strength training. The Cross Fist Boxing is broken down. One of very few books from Taiwan on the CLF style. Nice photographs, clean layout. First published in October of 1931. Mr. Xue attended the Shanghai JingWu Association. The book's contents are divided into four parts, the first section; practicing boxing ten word formula, the theory of usage and formal practice, etc. ; the second part: armed and empty handed matters with descriptions of stances and fist formations and their use; the core contents section: teaching self defense, a syllabus on using strength, fast-slow smooth-broken, a discussion on Internal and External forms of boxing, a description of the Internal and External schools and their good points, the fourth section: boxing manual (the Han Tan Tui, Gong Li Quan, the 14 Section Praying Mantis Boxing, the DaMo sword, the Five Tigers Spear, etc.). NOTE: This book is text only (no illustrations) and in Chinese . Nice short sections and possibly a fun book to translate. Written in 1931 (republished in 2002), this is a classic text on the WuDang Sword. Huang Yuan Xiu not only discusses sword basics, construction and philosophy, but demonstrates a two-person usage. Margin notes clarify textual points. Photographs, though old, are clear and easily understood. The traditional Chinese characters are very cleanly printed. 43 illustrations, mostly photographs. A nice text. An appendix discussing the teachings of Li Jing Lin (Fang Chen) one of the greatest sword practitioners of the 20th Century and a person dedicated to organizing and preserving sword technique. This is a key book for the researcher. Written by Xu Yi Quan (alternate spelling), this book's First Edition was published in July 1936 by Shanghai Commercial Publication. This book is republished corresponding to the First edition. The content includes: the inscription, the author profile, the Jin preface, the author's preface, the origin of Tai Ji Yuan Kong, the introductory remarks, the anecdote of Da-Chuan Sha, the diagrammatic explanation of Chuan Na Boxing 55 forms, the illustrations. Chuan Na Boxing was created by "South Expert" Mr. Ming Sha (Da Chuan Sha). The movements were obtained from his master, Mr. Yue Qun Wang's, Tai Ji Yuan Kong. Mr. Yi Qian Xu reorganized the original 30 forms of Chuan Na Boxing, and added the "Lightning Hand" of Tai Ji Yuan Kong and compound forms. He deleted unnecessary moves and refined to 55 forms. If we look up the meaning of Chuan Na, "Chuan" means to shoot with unfailing accuracy, and "Na" means to capture the opponent. This form appears to be from the Cha (Muslim) style. Read the translated description from the back of the Chinese edition. From 1926,Shanghai, this is mostly a text with few illustrations other than a few hand positions and a couple of truly great old photos of group stance practice. 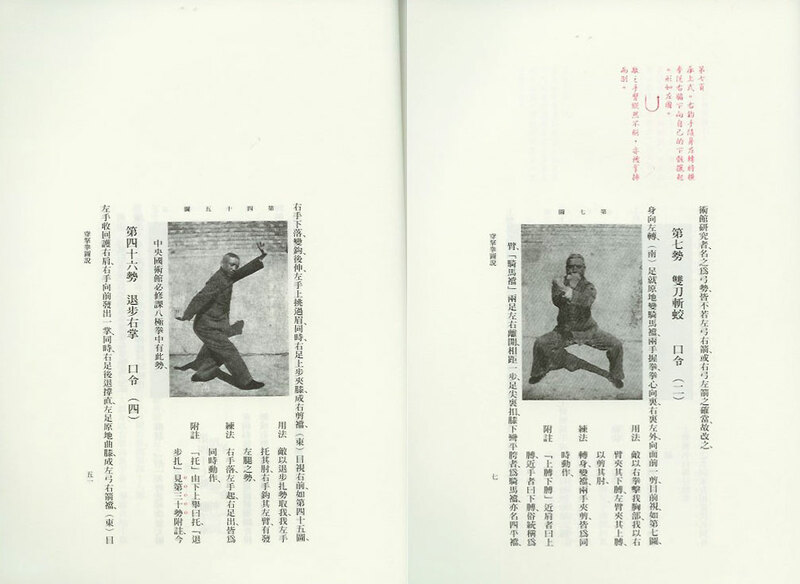 This book is divided into sections about the body with written applications to martial arts. It also focuses a lot on the Dragon Fist. A form from Shaolin the title refers to the founder of the Shaolin Chan sect. A possible candidate for translation but few drawings. This is a BIG book about External Training. Mostly text and a great candidate for translation it has many sections: pressure points; hand conditioning, Kung Fu hand positions (old photos). This is a collector's text living up to its name and concentrating on point manipulation, the right hand positions and associated information. As we've said, mostly text, but a very interesting reprint indeed. Originally issued in 1934 this is a hard one to find. August, 1930 first edition, Shanghai. This book is comprised of a number of sections including parts on martial history, general remarks, the Eight Sections of Brocade, Five Animals Boxing, Yi Chin Jing, and Twelve Road Tan Tui. 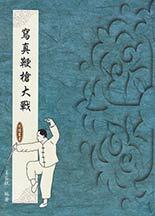 The author was a Wu Shu scholar from childhood and had researched many styles and systems of Chinese martial arts. He was once an assistant deputy in the Nanjing Central Training Hall when Nanjing looked to be the center of the Wu Shu world. At that time he began the compilation of massive studies. This large book represents some of that work. All boxing sections are illustrated with, perhaps, the most unusual (or some of the weirdest depending) figures of the practitioner in what appears to be a Red Sox World Series Baseball uniform from around the turn of the century. Click picture to get an idea of how "unusual" the illustrations really are. 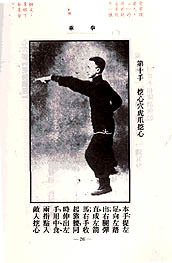 Yang Jia Tai Chi Chuan Ke Yi Yao Yi. 122 pages with photographs. this is a reprint of a book on the Yang style that was first published in June, 1936. Besides some very old photographs of teacher it contains a tipped in plate of the footwork for the Tai Chi set. Many topics are covered in this early series of writings: Tai Chi Classics, proper practice methods, many notes on the Tai Chi Sword, the Da Lu, the Primordial (Hun Yuan) Chi, Push Hands and others. Originally published in 1934. This is a good text for those who like usage. Every motion is demonstrated in the formal sense then given a traditional application. Most of the applied technique could be categorized as Chin Nah with striking back ups. Great old pictures of players showing the details of the strikes and points. This is from a very rare set called Shun Hand Boxing which, like Tai Tzu, is one set with 360 movements. This represents 30 moves and is the only text on the set known. A nice old text. Originally published in 1933 this boxing book has some great old photos of the author demonstrating forms, chi kung and exercises. Though most of the book comes under the heading Da Hung Chuan (Big Hung Fist, a famous Shaolin term) there are also sections on Cross Hand Set, Ten Hand Legwork, Big Hung Fist, Tiger Claw Fist (actually more with Sword Fingers), Escaping Method, Yellow Dragon Boxing and more. The poses have that stiff but definite feeling of old masters photographed when Kung Fu photo-recording was just beginning. This is a family style from the Emei group which has many many forms. Originally from a family manuscript entitled, "Da Mo School Boxing." Written in 1929 this is an important collection of notes and sections on Chinese Martial Arts. After various introductions it discusses massage, points, hand conditioning, Hei Kung exercises for health correlated to specific postures and striking points. Also there is a discussion of such esoterica as "Poison Hand", "Red Sand Palm", "Yin Hand", "Flying Hand" and "Black Sand Palm". Other sections include a general discussion on WuShu. Editorial comments in red ink on the margins clarify obscure passages. Nice old photos. Originally published in 1930 in ShangHai. After a preface the book is divided into six sections. Among these pages deal with the sword itself, the hand eye and body methods, single person practice methods, the Duckweed sword itself. The sword is derived from ancient sword practice which was, for centuries, a hidden technique. Until its publication this form was considered rare with technique passed on only rarely. This is a wonderful early BaGua text by Mr. Sun a student of Cheng You Long the son of Cheng Ting Hua. 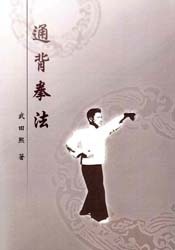 This book shows the 8 classic Palm changes, then has sections on Standing, two person work, BaGua knives, BaGua sword, BaGua Big Knife, BaGua Fang Tian and more. Photographed in front of a hypnotic spiral design this is a famous text from the very early days of BaGua publishing. This rare text was published at the beginning of the Republic making copies of the first edition difficult to locate. A student of Chinese martial arts since childhood, Zhu was a medical practitioner and a good writer. This was his attempt to meld modern gymnastics concepts with martial skills. This is indeed an odd text. It shows some very strange postures associated with a makiwara-like instrument and the plans for building it. (see scan). $13.95 Traditional Chinese Characters; 100 pages, great old photos. Originally:1930 ShangHai World Publishing. This is one of the few books every published showing the "Tiger Tail" whip also known as the "firm" steel whip. This ancient weapon is a segmented rod used somewhat in the fashion of the straight sword. A nice set with detailed descriptions. Additional calligraphy by Li Xian Mo, Zhang Shun Xiang, Zhang Jian Quan and Li Li. The author was a well known teacher of the whip which is an ancient weapon which gained respect in the Tang and Northern Sung Dynasties. Whips come in "hard" and "soft" and different styles such as Watermill and Tiger Tail. 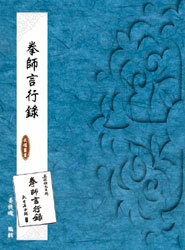 This version is said to be from HeBei Salt Mountain through Liu Jiu Ru to Zhang Xian Dao then Li Yu San to the author. 94 pages, great old photos. Originally: 1930 ShangHai World Publishing. This is a nice sword set with some great photographs of good, solid formal postures. Contents of this classic volume include an introduction by Lu Wei Chang. Then the structure of the book is divided into two sections. The first demonstrates the DaMo (Boddhidharma) Straight Sword. Jiang Su Yao is also supposed to have contributed to this text. After a set with some unusual postures and footwork there is an entire section of notes. This second section notes details on the art of the sword. There are even line drawings of the typesof strokes practiced and performed with the sword. A nice old text. In this case "Nobleman" refers to a person of noble character. This rarely reprinted book shows the Nobleman's 24 strikes and the form. The type sword used here is of the "Double Handed" variety. Consequently the energy for the Double Handed Sword is said to come more form the heels, while the typical short sword comes more from the back muscles and spine: they are not played in the same way. Large, charming illustrations show an armored warrior with facing page explanations of the movements. The record of thoughts of a sage boxing teacher. September, 1923 Shanghai Zhen Min Editorial Society Publishers. Traffic Map Library distributors, Lou Tian Quan annotations. Xiang Kai Ran corrections. Mei Xia Hun editor. 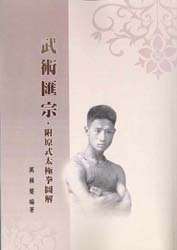 This book's author described this as “A catalogue of anecdotes observed in Chinese Boxing. Republished in 1933 there are numerous sections (117) including commentary on characters, Confucian principles, events and anecdotes, with specific sections like "A Shifu's collection", "Uprightness", "Chivalrous Record", "Teaching Students", "Punishing Traitors" and others. Could this be the original version of our "Instructor's Notebook"? This is a great candidate for translation, partial or complete. This book of martial essays seems to be the work of one person. Setting aside its claims of great antiquity it is a surprisingly thorough commentary on the boxing arts. It compasses the human body and its martial functions, principles of Buddhist belief, energy issuance, celestial footwork patterns and much more. According to Lion's comments this is a find for most martial scholars and should be "savored". Charming woodblock-type illustrations from old texts. Read a translated section from this book. The ordinary person creates power to the front and back left and right. In every direction this way, and furthermore, they attack with so-called straight actions: Front and back, left and right,even two such attacks are said to be marvelous. This is the typical method of force we encounter! As for those with really imposing strength; to defeat such force proceeds from definite foreseeable expectations outside normal methods. If some old friend tries to throw me then I use Gua (hang), if he uses Gua (hang) then I redirect, if he redirects then I slice, if he slices then I retreat, if he retreats then I angle in. Whether the attack comes from the inside or outside there can be no deliberation.The changes are innumerable, ancient or modern these movements are stirred in this way. We should not stare, astonished. In times past it was called Lost Boxing [ this Lost Boxing has six sections, we will recount them later].